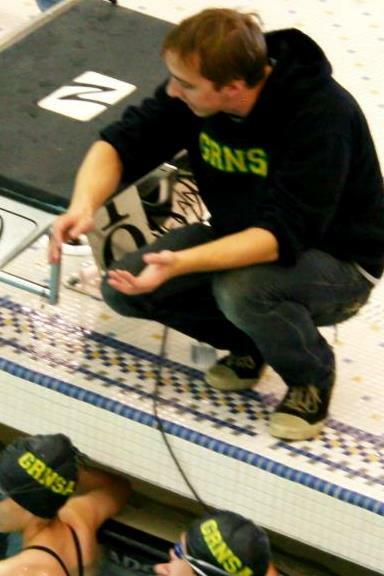 Alexander Brinks joined the Grand Rapids Aquatics coaching staff in January of 2011. His primary objectives are to help age group swimmers to develop as young student-athletes and to provide children living in the South Grand Rapids area with preliminary exposure to the sport of swimming. While in high school, Brinks taught swim lessons for Hudsonville Public Schools from 2002 to 2005. 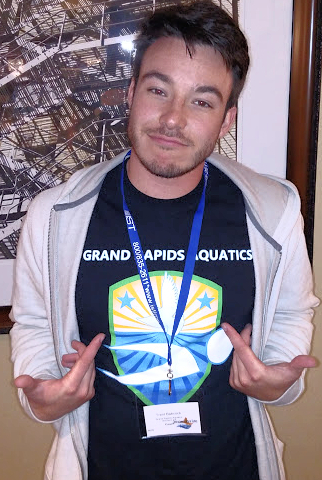 He spent the next four years swimming and studying at Oakland University (OU), and from 2005 to 2008, Alex was a lifeguard and swim lessons instructor for the Oakland University Rec Center throughout the school year and for Grand Rapids Parks and Rec during the summer time. In 2009, after graduating from Oakland with a B.A. in English, Alex began coaching and substitute teaching for Grand Rapids Public Schools. During the 2009-2010 school year, he assistant coached the Ottawa Hills High School girls and boys teams and also coached the West Michigan Masters group at Grand Rapids Community College. From 2010 to the present, Brinks has been the head coach for the Ottawa Hills High School girls team. He head coached the South Middle Schools (Alger, Gerald R. Ford, & U-Prep Academy) co-ed swim team from 2010 to 2014. He is an ASCA Level 2 coach and lifeguard instructor. From 2010 to 2011, Alex has also worked as a pool supervisor at the Salvation Army Kroc Center and an assistant manager at Martin Luther King Park. A native to West Michigan, Alex was born in Grand Rapids and grew up in Hudsonville. He started swimming at seven years old with the Hudsonville Dolphins & Jenison Wildcats Community Swim Teams. Brinks went on to swim for West Michigan Swimmers (WMS), Hudsonville High School, and Oakland University. In his 16 years as a competitive swimmer, Alex has been an age group state champion, high school All-American, and earned Academic All-Conference honors all four years in college. Jerron Julien joined the Grand Rapids Aquatics coaching staff in May of 2011. He believes that swimming is a lifelong activity which offers life enrichment from swim lessons all the way to masters. He has a particular passion for helping to provide children in the city of Grand Rapids with new opportunities by aiding in the construction of an elite urban swimming community. In the fall of 2007, Jerron began assistant coaching both the girls and boys varsity teams at Grand Rapids Union High School. He has run programming for the Grand Rapids Public Schools District that has helped children living in West Grand Rapids to realize their potential both in and outside of the pool. Jerron has been responsible for organizing study tables that have provided academic support to his high school swimmers and coaching the first Grand Rapids Union swimmer to achieve All-Conference honors since the schools entrance into the OK Conference in 2008. He is now the head coach of both programs at Union High School. From 2008 to 2009, Jerron began the process of building a middle school program for the entire GRPS district. He coached the South Middle Schools (Alger, Gerald R. Ford, Martin Luther King, and Sherwood) co-ed swim team in 2008, the West Middle Schools (Burton, Harrison Park, and Westwood) co-ed swim team in 2009, and has continued to work on grant proposals that have kept the program going. Jerron has also been responsible for much of the staffing and promotion of the GRPS middle school program that has transformed it from a strictly learn-to-swim operation into a league of fully competitive swim teams. He is the current head coach of the North Middle School team. Raised in Grand Rapids, Jerron was a graduate of Union High School. Despite starting competitive swimming relatively late, his excitement and dedication to the sport lead him to multiple conference finals in the Grand Rapids City League. He swam for Union on the very team he now coaches and then for the West Michigan Masters group at Grand Rapids Community College, where he was a student. Jerron is an ASCA Level 1 Coach. Coach Amber began working for Grand Rapids Aquatics in May of 2012 as a swim lessons instructor. She loves working with the swimmers and growing the experiences available to all children. Amber was born and raised in Wyoming Michigan. She raced competitive age group swimming for the Wyoming United Swim team based out of Godwin Height's Pool until the team was disbanded. A few years later, Amber was in the school Phys. Ed. Building and heard noises coming from the Pool Deck. Curious to see what was happening, she wandered onto the pool deck finding a new home swimming with and working for GRNSA (now GR). Through the years she has grown her experience, coaching two seasons for the Grand Rapids Gators, and now coming back to work as a swim lessons coordinator and assistant age group swim coach for GR. Coach Amber also coaches for GRPS South Middle school swim team serving as their head coach, as well as West Catholic High Schools girl's swim and dive coach, and Caledonia High School boy's head dive coach. 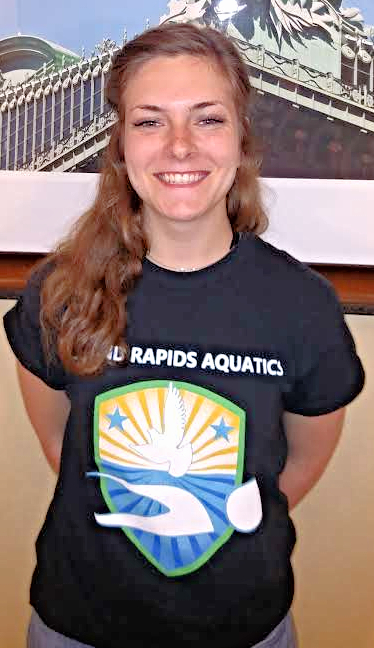 Sarah Dinkel started working at Grand Rapids Aquatics the November of 2017. She is passionate about swimming, and enjoys passing on her knowledge of the sport, as well as working with children. After years of taking numerous swim lessons, Sarah joined the Grand Rapids Gators. After a small break in her swim career, Sarah joined West Catholic High School's swim team, where she swam all four years. She swam in the top eight in the OK Rainbow Conference for three years, and was team captain her senior year. Once her final season on the swim team was completed, she started working at Grand Rapids Aquatics as a swim instructor. She now attends Grand Rapids Community College and is studying for a degree in dental hygiene while working as an assistant age group coach for Grand Rapids Aquatics. Trenten Babcock competed as a member of Grand Rapids Aquatics From 2010 to 2012, before returning as a coach in June of 2017. He graduated from Washington and Lee University (WLU). Extensive experience in the sport of swimming guides Trent as he nurtures physical, emotional, and intellectual development in his swimmers. Trent fell in love with swimming at the young age of seven, however he did not discover his passion for teaching until serving as a swim lessons instructor for Grand Rapids Aquatics while in high school. This passion for teaching continued into college as a swim lessons instructor, math tutor, and student-athlete for Washington and Lee University. Trenten successfully completed four years of collegiate swimming earning three Conference Championships; three All-Conference selections; was a five-time Conference Champion; as well as multiple varsity and conference records. These experiences have continued to serve as excellent motivation for helping future generations of swimmers from his hometown develop into strong, healthy individuals.